Quick update: If you type in ‘2*4’ it will actually do the math for you. However, typing in ‘pointless’ still returns no results. I’ve long assumed that most folks who call themselves ‘gurus’ are pretty deficient in the guru-ness department. Turns out, the same is true of automated chat bots. Google just launched Google Talk Guru in Google Labs. 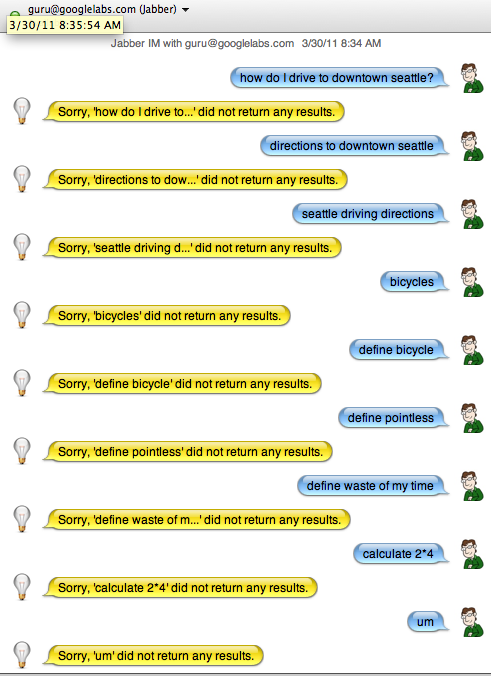 You’re supposed to be able to send it basic queries like ‘calculate 2 * 4’ or ‘define bicycle’. Elizabeth Marsten’s new 2-part PPC e-book for small business. $37 for books 1 and 2, and a money back guarantee. I suppose even Watson was “of vacuous reply” at one point. Poor guy. I seem to remember you labeling many Portent employees “Gurus” at one time.